Nox-Crete was asked to consult on a difficult decorative concrete sealer stripper project. A 3500 square feet stamped pool deck had been sealed and resealed over time with up to five coats of an acrylic sealer with 25% solids. No stripping had been done between layers. This thick film buildup had created an impermeable barrier that trapped water vapor coming up from the subgrade. Pressure from the water vapor caused the sealer to delaminate from the concrete, which turned some areas white in color. In addition, the thick film had suffered UV damage, and appeared dark green. A test was conducted to determine the best method to remove the old coats of sealer. The test was scheduled for a clear day with a temperature of 84-degrees Fahrenheit. There was a slight 7 mph wind and 52% humidity. Aro-Peel stripper system with an engineered cellulose blanket was applied to a small area next to the house. Aro-Peel decorative concrete sealer stripper blanket system is sold in Canada, and a similar product—Deco-Peel—is sold in the United States. Deco-Strip sealer stripper was rolled on a large section, and then pressure washed according to use instructions. Deco-Strip sealer stripper was applied with a sprayer to another large section. The section was then scrubbed with an electric floor scrubber to loosen acrylic layers and then pressure washed according to use instructions. Aro-Peel’s controlled blanket application strips decorative surfaces of aged, chalky or faded sealers without pressure washer, accidental splatter, or the creation of hazardous waste. This is best for areas against a house where splatter can cause problems. The test area was next to the house, and was applied in direct sun in an area with little to no wind. The surface was swept clean of debris, and the crew cut and shaped the blanket to fit the test area. The Aro-Peel was rolled onto the blanketed surface until the fabric was fully saturated and had turned translucent. Special care was taken to saturate all valleys, joints and ridges on the surface until the surface texture was visible through the fabric. After 3.5 hours, the blanket was peeled up to check for evidence of acrylic and to ensure that the surface wasn’t slimy. This is an indicator that the acrylic is still softening and has not absorbed into the blanket. Once the blanket had dried, it was peeled back and placed into garbage bags for proper disposal. Aro-Peel successfully removed all five layers of acrylic sealer in this test. However, it must be cautioned that a second application with fresh blanket may be required to remove this many layers of sealer. 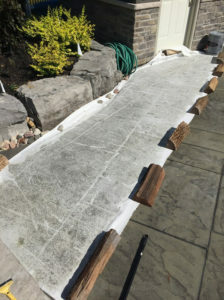 A large section of the pool deck was swept clean of debris, then Deco-Strip was roll-applied and allowed ample dwell time to penetrate all the way through the acrylic sealer. Multiple light coats kept the Deco-Strip wet until the acrylic had been softened. Dwell times generally range from 30 to 90 minutes depending upon thickness of sealer to be removed and application rate of Deco-Strip. When the sealer was soft all the way through, it was time to remove with a pressure washer. With five layers of sealer, this method was difficult. In this test, the traditional way to use Deco-Strip required a lot of water, gas for the blowers and also took a long time. If the patio had two to three light coats and was smaller—this would be an acceptable method. The test did resolve the problem, but it was decided to use another method to reduce the man hours required. A modified application test used a sprayer to apply the Deco-Strip to a large area. The Deco-Strip was allowed to sit for 3 to 5 minutes. The crew then moved the floor scrubber onto the wet product and started scrubbing in a circular direction using scrubbing pads. The scrubbing pads were replaced every 3 to 4 minutes. To remove 5 layers of hardened acrylic, 3 pads should be used in a cycle pattern: using one, cleaning one and holding one on standby. Once the scrubber operator and machine had moved to a new area, the previous area was lightly pressure washed to direct the stringy/sticky bubble gum-consistency old acrylic residue into a “rope” line. Larger pieces were scooped up with a shovel. This modified method shortened the required time by 80%. 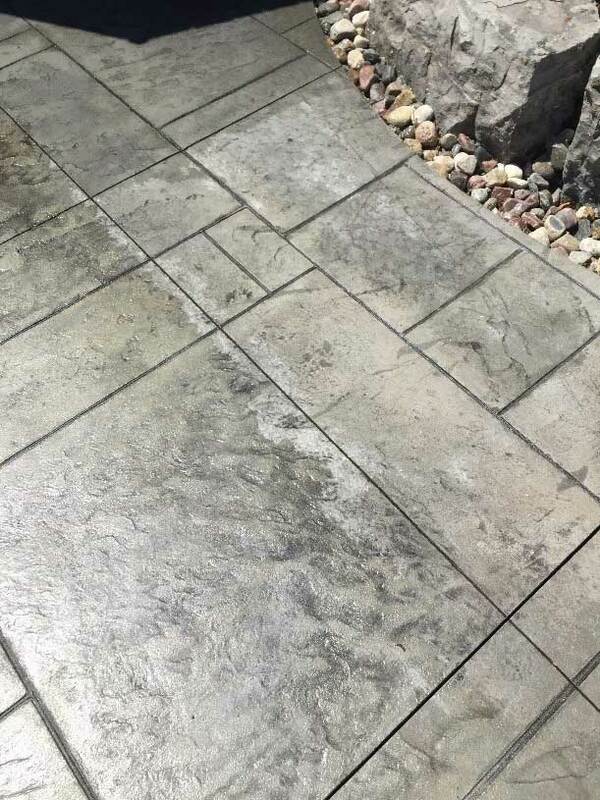 The stamped concrete was successfully restored back to original unsealed condition. Natraseal LVOC acrylic sealer was used to finish the project. UV inhibitors will prevent yellowing over time, and the homeowner can expect a sealer lifetime of up to five years. 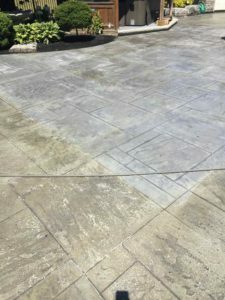 This entry was posted in Decorative, Nox-Crete Blog, Project Profile, Testing and Results and tagged aro-peel, Deco-Strip, decorative concrete, decorative sealer on May 23, 2017 by Aaron Nussbaum. The weather is warming up and it’s time to take a good look at your client’s pool deck, backyard patio, outdoor walkway or other exterior textured/stamped concrete. Is the decorative concrete acrylic sealer faded, chalky, yellowed or worn out? Don’t reapply another layer of sealer – or you’ll risk bubbling, peeling and blistering. Strip the sealer first, then apply a fresh coat of acrylic sealer for beautiful results. In the past, removing acrylic from concrete required the use of hazardous solvents like xylene. The solvents used in traditional strippers (xylene, toluene and mineral spirits) are considered hazardous by the EPA and OSHA. Any spent residue resulting from the use of these solvents is strictly regulated and must be disposed of through a licensed disposal facility. Xylene is flammable, and causes skin irritation. Inhaling xylene vapor causes acute symptoms such as: headache, dizziness, nausea and vomiting. Long-term exposure may lead to headaches, irritability, depression, insomnia, agitation, extreme tiredness, tremors, impaired concentration and short-term memory loss. To combat the use of these hazardous solvents, Nox-Crete’s chemists combine a proprietary blend of biodegradable and environmentally-friendly solvents and surfactants. Nox-Crete’s decorative concrete sealer strippers are xylene-free and safe to use. The solvents used in Nox-Crete’s decorative concrete sealer strippers are 100% biodegradable, nonhazardous by EPA definition and are safe for disposal in any storm water or sanitary sewer system. 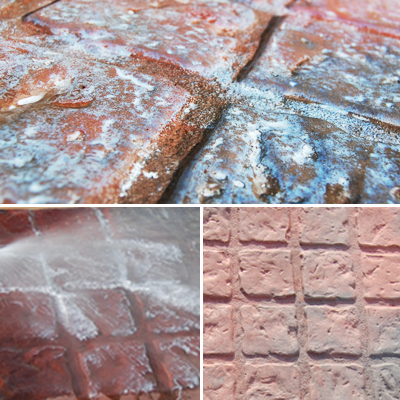 The powerful, biodegradable coating stripper penetrates and softens decorative concrete acrylic sealers. 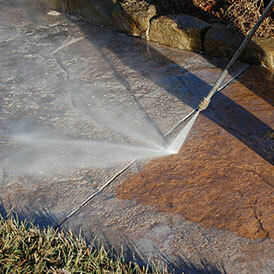 Deco-Strip can be removed with a power washer to restore decorative concrete back to its original unsealed condition. Use a scrubbing machine to speed the stripping process of multiple layers of decorative concrete sealer. Deco-Peel is a two-part system, which includes 5 gallons of stripper and an engineered fabric blanket which covers 400 square feet. The blanket is cut to fit around curves, corners and hard-to-reach areas; then saturated with the stripper. The acrylic resin is absorbed and dries into the fabric blanket, which can then be peeled up and thrown away. The margin of error in application is greatly reduced with this simple system. This entry was posted in Decorative, Nox-Crete Blog, Top Ten Tips and tagged Deco-Strip, decorative concrete on April 6, 2017 by Aaron Nussbaum. 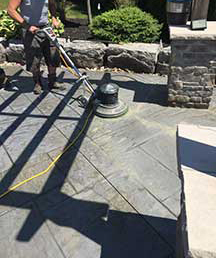 When Nox-Crete’s Eastern Canada Division Manager, Mike Gauthier arrived at a jobsite earlier this year, the task at hand was one familiar to decorative concrete professionals everywhere – removing a decorative acrylic sealer from stamped concrete surrounding a residential pool. 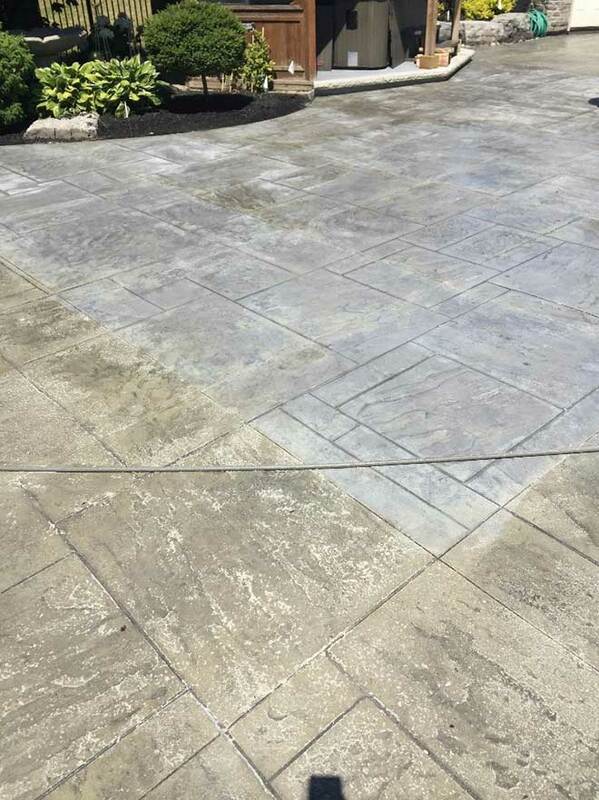 This entry was posted in Decorative, Project Profile and tagged Acrylic Sealer, Canada, Deco-Strip, decorative concrete, pool, sealer removal, Toronto on August 1, 2014 by Aaron Nussbaum. Nox-Crete Products Group announces three new products for first quarter; Deco-Strip, Tag-Erase and Tag-X. Each product brings a unique innovation to Nox-Crete’s performance and quality-driven line of products. This entry was posted in New Products and tagged Deco-Strip, decorative sealer, graffiti, new product, tag-erase, Tag-X on February 20, 2013 by Aaron Nussbaum.